I’ve got a to-do list that’s a mile long, it sometimes feels, and I’m sure you can relate. My list is important, and it helps me focus on what I need to accomplish and prioritize my tasks – both essential undertakings. But man, can it be a drag! What’s more, it’s not as useful as you might think. The time you spend on your to-do list doesn’t always match up with what the list actually states, as you probably also know. That’s why a done list might be just as important. 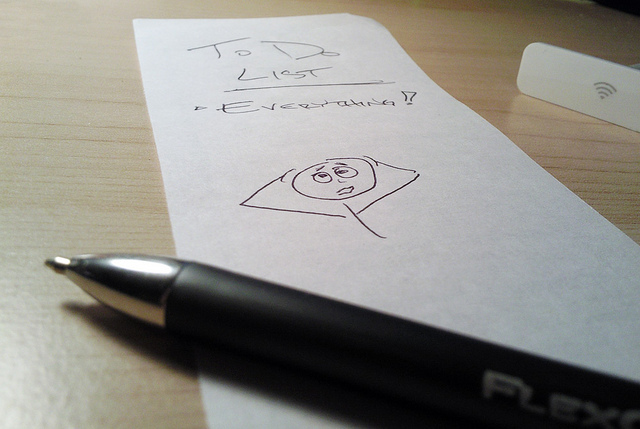 Writing down tasks as you complete helps you capture all those extra tasks you’re doing that weren’t on the list. Knowing what you’re working on lets you truly understand where your time is going, and that gives you the daily picture you need. It’s also a psychological boost – you get a rush every time you write something down, knowing that it represents an achievement. Contrast that with adding things to your to-do list – talk about anxiety stressors! Try keeping a done list with you through they day for the next week and see how you feel at the end. Imagine how nice it will feel to look back on all that you did!